[PDF] Computational Science and Its Applications ICCSA 2015: 15th International Conference, Banff, AB, Canada, June 22-25, 2015, Proceedings, Part III (Lecture Notes in Computer Science) | Free eBooks Download - EBOOKEE! 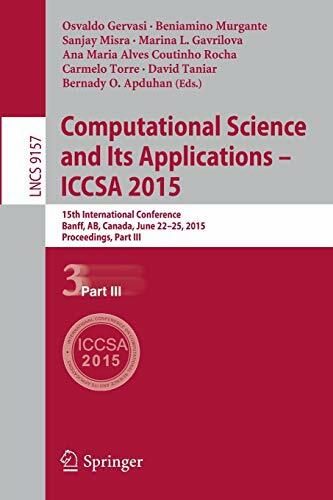 Description: The five-volume set LNCS 9155-9159 constitutes the refereed proceedings of the 15th International Conference on Computational Science and Its Applications, ICCSA 2015, held in Banff, AB, Canada, in June 2015. The 232 revised full papers presented in 22 workshops and a general track were carefully reviewed and selected from 780 initial submissions for inclusion in this volume. They cover various areas in computational science ranging from computational science technologies to specific areas of computational science such as computational geometry and security. No comments for "[PDF] Computational Science and Its Applications ICCSA 2015: 15th International Conference, Banff, AB, Canada, June 22-25, 2015, Proceedings, Part III (Lecture Notes in Computer Science)".